Happy color and weekend wishes. Oh yes, we NEED a little color! Oh yes we need a little color! I’m needing some color! It’s been a long (and sad) week, hasn’t it? I feel like I am starved some good global news and happiness for all. At lease, freedom from fear. Sorry to be a downer, but along with global news, my little love RoyRoy has hurt his back. It’s a common ailment among dachshunds, but scary nonetheless. There’s lots of carrying him and keeping him calm and not jumping off things such as the sofa (hence the baby gate). 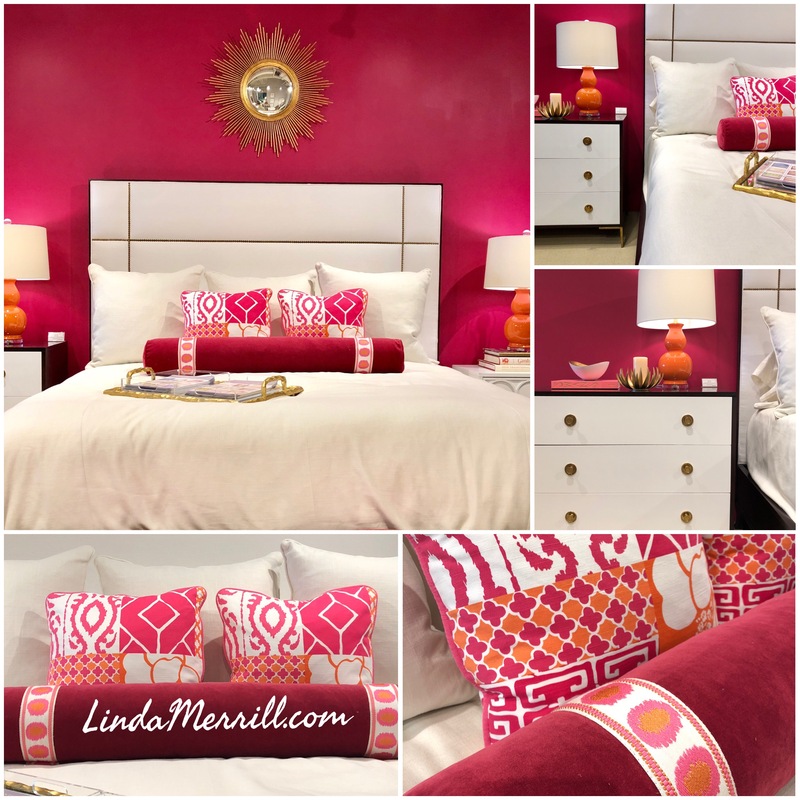 I’m at the Boston Design Center today for my Designer-on-Call day and the Century Furniture showroom has updated it’s main display with this fabulous pink and white bedroom setting (seen up top). This is such a happy, uplifting color, isn’t it? I so needed this lift! I was interviewed for an article on House Beautiful’s web site about designer’s least favorite colors. Of course, it’s all subjective. I didn’t agree with many of the other designers and some probably didn’t agree with my assessment that I’ve seen enough gray for one lifetime. Now don’t get me wrong, gray can be beautiful. But it’s become so ubiquitous as to be boring and uninteresting. Nearly every house on a recent house tour I went on was painted some shade of gray. Again, it’s beautiful, but I miss color and variety! Don’t you just feel a little more cheerful? Well, not everyone will like this color of course. Some may find it too overwhelming. 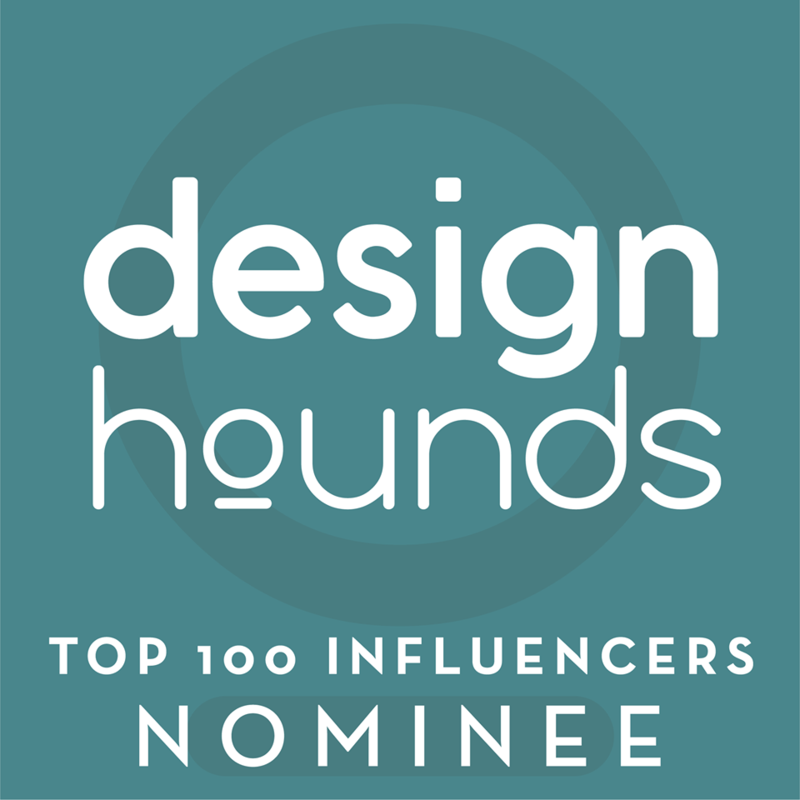 On another note, I’m honored to have been nominated for the Modenus DesignHounds Top 100 Influencers list! I’d be so honored for your vote! Vote here. Wishing you a relaxing and peaceful weekend! I agree wholeheartedly that color is needed! It truly is a mood elevator. Thank you so very much for your kind comments about our sweet girl Gracie. She’s having a few behavioral issues but I’m sure she’ll settle in time. We are doing our best to train her to use the stools provided to climb up on the couch and avoid the stairs. We are SO sorry to hear about dear Roy Roy. Our best wishes for a speedy recovery. Years ago Rudi had an issue with his back and we had to keep him crated for 30 days, give steroids, carry him outside etc. Thankfully he healed and has had no further issues. It’s scary I know. Hang in there, Mama! Thank you Laura! I am just so worried about him. From what I’ve heard from friends, it seems 50/50 – surgery versus bedrest doing the trick. He’s really not wanting to walk – though he can. Taking him out (carrying of course) is a test of my patience because he just sits and doesn’t want to walk enough to be able to do anything. Then finally he does and is able to take care of his needs. I’m not looking forward to doing this come winter! Oh yes, we need color! Seems like every blog, instagram, Pinterest and magazine only show photos of boring, monotonous white and gray rooms. Every picture looks just alike. Nothing original or interesting and I really find the gray quite depressing. I’m so happy to see so many designers showing happy, colorful palettes once again. Me too Gerry! Thanks for stopping by!